Pollution and microbial hazards are greatest in coastal waters, where most recreational activities occur. By Michael Miller, Ph.D., and Petar Denoble, M.D., D.Sc. The hazard of human infection for those exposed to the sea has been known for a long time, but the public is becoming more aware of it as new evidence of the oceans' rapidly deteriorating health emerges. Even the most pristine seawaters are inhabited by large numbers of microbes. Most of them are harmless to humans, but some, like the vibrio species, can make people sick or even kill them. Increased pollution, warming and acidification of the oceans, all of which cause the death and extinction of fish and coral species, also promote the growth of indigenous microbes and increase the concentrations of terrestrial pathogens. Pollution and microbial hazards are greatest in coastal waters; unfortunately, this is where most recreational activities occur. Indigenous and introduced microbes may cause illness in humans either by infection or indirectly by intoxication. The sheer volume of seawater and its constant movement usually dilute foreign microbes below concentrations necessary for human infection. But there are many conditions when critical concentrations may be reached or when the threshold for infection in an individual is lowered. The greatest risk for human health comes from consumption of seafood. Human potential for contracting diseases from pathogens in the marine environment depends on exposure time, the virulence of the pathogens and the susceptibility of the individual. Microbes generally infect humans through ingestion, inhalation or mucous-membrane exposure (naturally occurring or in wounds). Microbes can infect through injured skin, the ears and the mucosa of the mouth, eyes and nose. Infections may also result from swallowing water. Nonfatal drowning in marine environments brings seawater into the lungs and can result in pneumonia. Some hazards like aerosolized bacteria, generated in coastal environments by wave activity, can transmit algal toxins to humans and cause viruses to become airborne. Risk of direct infection by microbes from seawater is very small. 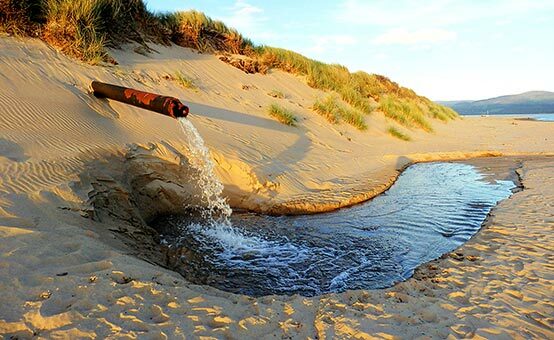 However, the risk increases significantly in warm, brackish waters, in waters proximate to sewage and run-off inlets, at places of animal access and at populated beaches. The most common infections reported due to prolonged seawater exposure are otitis externa (swimmer's ear) and skin infections (impetigo and others). Fortunately, these can be easily prevented, diagnosed and successfully treated. 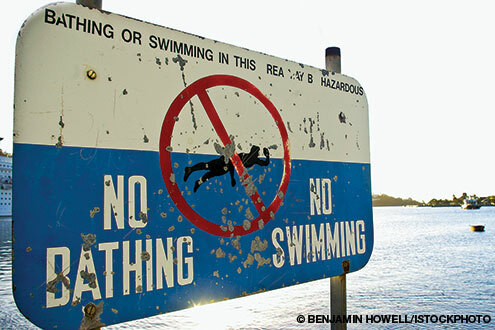 On the other hand, swimming with an open wound may result in a rare, but often fatal, infection with Vibrio vulnificus, an opportunistic pathogen commonly found in warm coastal waters. The Centers for Disease Control and Prevention receive approximately 150 reports each year of people infected with V. vulnificus, most by eating oysters and a few through open wounds. Some fear sinusitis and cystitis (bladder infection). Indeed, swimmer's sinusitis has disrupted the careers of many aspiring athletes. However, it is most often caused not by microbial infections but by chemical irritation from chlorine used to disinfect pool water. It does not occur in ocean swimming. Indeed, some people with chronic sinusitis maintain that swimming in the sea and flooding their sinuses with salt water helps, a notion seemingly supported by an increasing number of ear, nose and throat physicians who advise patients to use saline sinus rinses to relieve nasal and sinus congestion. However, it's important to remember that the intentional or inadvertent introduction of seawater into the sinuses could cause infection if the introduced water is loaded with a sufficient number of pathogenic bacteria or viruses. It is difficult to come by any such cases in conventional medicine literature. The effect of swimming on cystitis in women is a popular topic of discussion in the media. The prevalence of cystitis is very high, and in many cases it is recurrent. Each occurrence often is the result of infection by a new causative microbe. Chemical irritation from chlorinated water or the prolonged wearing of a wet swimsuit may enhance the recurrence of cystitis, regardless of the bacterial contamination of fresh or salt water. When it comes to cystitis, it may be a predisposition rather than a specific causation that affects its occurrence. Join DAN Boater today and get immediate access to our Medical Information Line for non-emergency medical questions before, during and after you travel. While it seems there are many microbial hazards in the sea, the true risk of serious infection seems negligible. Most infections that may be occurring among beachgoers and swimmers probably manifest as diarrhea, but that is so common among travelers it is rarely linked to seawater. To mitigate risks of infection, regularly clean and disinfect any watersport equipment, avoid polluted waters, never enter the water with open wounds (including tooth extractions) or sores, never rinse your mouth or sinus cavities with seawater, keep your ears dry, avoid prolonged wearing of wet clothing and be sure to shower after. Those with an acute infection such as a common cold, conjunctivitis, skin infection or gastroenteritis must take precautions not to infect others. Waterborne disease outbreaks (WBDO) have been reported in people bathing in pools and rivers but not among seaside beachgoers. However, due to presence of the diarrhea-causing microbes on seaside beaches, epidemiologists assume that cases of gastroenteritis resulting from exposure to marine pathogens must be common, too. The summertime increase in occurrences of gastroenteritis in coastal states indicates a possible role of beaches in disease transmission. In 2009 and 2010, scientists discovered methicilin-resistant staphylococcus aureus (MRSA) in the sand of many beaches on both the West and East coasts. MRSA causes intrahospital infections with a high mortality rate due to its resistance to many antibiotics. MRSA also occurs outside of hospitals, but the source of infection is not known. Seasonal increases in MRSA infections coinciding with times of increased beach use may indicate beaches are a possible means of MRSA transmission. From a public health perspective, monitoring popular recreational areas for various indicators is one of the major steps taken in risk reduction. There were more than 24,000 beach closures and advisories in 2010, the second-highest number on record. The majority of these were due to the presence of bacteria. Scientists and public-health officials rely on several factors to determine whether risk of infection is elevated in a particular area. Unsurprisingly, the presence of sewage is correlated with elevated infection rates. Gastroenteritis and respiratory illness in particular increase with the degree of site pollution. 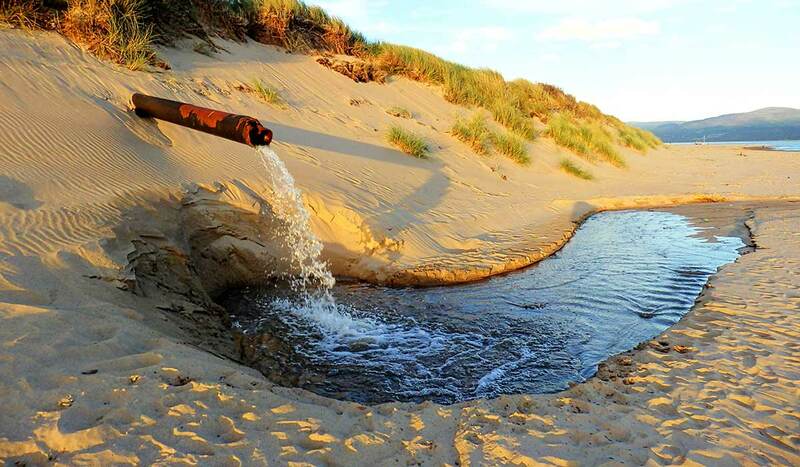 Pollution with sewage is generally assessed by monitoring the presence of enterococci bacteria. High swimmer density is a second factor shown to increase infection risk. Elevated numbers of minor ear and skin infections from human-shed bacteria are observed where swimmer density is high. Skin granulomas from Mycobacterium marinum have also been observed. Staphylococcus aureus levels have been proposed as indicators of exposure. Eutrophication, the increased abundance of algae, phytoplankton and other marine plants, may be linked to higher rates of infection by pathogens native to the marine environment. Runoff from agriculture and golf courses is a major cause of eutrophication. Blooms of plankton and algae can promote growth of associated populations of marine pathogens by increasing nutrients in the water and providing microenvironments that favor growth. The prevalence of Vibrio species has been proposed as an indicator for measuring eutrophication. Elevated seawater temperature is associated with increased incidence of shellfish poisoning and cholera. Remote sensing of sea surface temperature is being explored, but its predictive value needs further study. Thompson JR, Marcelino LA, Polz MF (2005). "Diversity, sources and detection of human bacterial pathogens in the marine environment" from Oceans and Health: Pathogens in the Marine Environment, Belkin S and Colwell RR (eds. ).